Machine-Friendly ? just select the hand wash cycle. Gentle on delicates including silk, wool and lingerie. Non-bio formulation. Gentle next to your skin and your clothes. Fresh Fragrance ? that goes on and on. Includes dosing ball on the lid.What does it do? We know it can be nerve-wracking washing delicate clothes like wool jumpers or silk dress, but with our Silk & Wool Washing Liquid you can just put it in the machine on a hand wash cycle and let the detergent do the hard work. Our Silk and Wool detergent has a mild non bio formula, which makes it ideal for sensitive skin. Everyone from new-borns to parents can benefit from Persil Silk and Wool?s gentle touch. How do I use it? 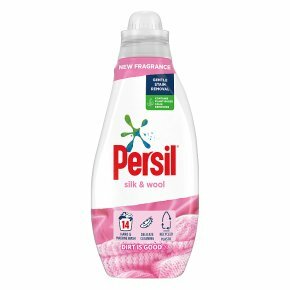 You can wash your delicates using Persil Silk & Wool Washing Liquid either in a basin, tub, sink or with the handwash cycle on your machine. If you?re washing by hand you might want to wear rubber gloves. First pour the washing liquid into the water making sure it?s mixed together before adding your laundry. For clothes that are stained, leave to soak for up to 30 minutes. Next, wash the clothes by wringing them until the water runs clear. Once you?re happy, drain the dirty water and rinse your clothes with fresh water to get rid of any traces of detergent. However if you prefer to use the machine just pour the liquid detergent straight into the machine drawer. Read your care labels, and choose the appropriate wash cycle, then you can get on with your day knowing the Persil Silk and Wool is removing all those tough stains for you. Causes eye irritation. Contains benzothiazolinone. May produce an allergic reaction<br>Keep out of reach of children. If in eyes: Rinse cautiously with water for several minutes. Remove contact lenses, if present and easy to do. Continue Rinsing. If eye irritation persists: Get Medical Advice/attention<br>As we are always looking to improve our products, our formulations change from time to time, so please always check the product packaging before use.